Saturday was bitterly cold with a wind that cut through jackets and made me wish for my motorcycle jacket. The morning was to be devoted to local gallery tours; we decided to walk the 900 feet from our hotel to the Briscoe Museum of Western Art. We all got to claim senior status and therefore a reduced entrance fee–although if we had been service men/women our entrance would have been free. Two large galleries were full of contemporary Western art —no photos were allowed–although I did get this shot of a rabbit by Tim Cherry. If I had the money or the place to showcase this piece—but I didn’t so I will content myself with this photo. Of interest was a small painting by W.H. Dunton whose title for a rather small painting was quite striking—a paragraph long title for a rider on a horse galloping across the plain. Interestingly the local Stark Museum of Art in Orange Texas posesses over 200 pieces of his work. He, along with other western artists of that era, also illustrated magazine covers and books. In the afternoon we settled down to an entertaining critique session with Judith Trager. Creative people that we are, one attendee removed her belt as a splash of color on a monochromatic piece. An evening banquet followed with a lively auction of the small pieces contributed by the members. There was much rivalry and last minute bidding–all to fund future events. There was a very long line waiting to get in to see the Alamo; the line looped back through a covered area and was halted by a photographer at the entrance. Inside, people chattered and pointed–and if you stood in one place, you heard the same comments repeated but by different people and in different languages. They marveled at the number of places the defenders claimed as home—Ireland, Wales, Scotland, North Carolina, Kentucky–and more. Flags of each state and country were displayed around the periphery of the building and we all took turns peering into the rooms cordoned off. Outside were lovely old live oak trees, a small rivulet with giant carp all hoping for a tidbit of bread, benches, and blooming prickly pear. Outside on the plaza were stands with soft drinks and ice cream. The Menger and the Crockett Hotels were nearby as well as the Wax Museum. No matter the details of those final hours in whatever version people care to claim as factual, it is an awe=inspiring place—so lush and green–and the entire complex quite large–not the dusty single building in a vast plain with nary a tree to be seen. I had thought I might catch a sunrise behind the Alamo but I admit to being distracted and then there was the building that somehow blocked my way–I had to turn on my GPS on my phone to find my way back to the hotel. In the meantime–what do you think about this? Conference morning activities followed breakfast punctuated by greetings–putting faces to names of people I had read about, ‘talked’ to via internet and handing out of business cards. My afternoon and evening were free as I had not signed up for breakout sessions, thinking I would like to settle myself somewhere on the Riverwalk and just enjoy the day. However, I am not a cold weather sitter on metal benches–and so I opted to walk. What time in San Antonio would be incomplete without a visit to the Alamo. The streets were filled with newly graduated AirMen–(and a few women) in their crisp light blue shirts and dark pants–all with parents or sisters or girlfriends all roaming about–all smiles, nervous, proud. I caught up with one nice young man and his two sisters–both shivering in their light jackets–they were from Pennsylvania and had dressed expecting much warmer weather. I wandered by the Cathedral–the first mass celebrated on the day appointed to Saint Anthony–thus giving the city its name, the Bexar County courthouse which was humongous and imposing in red brick and skepp topped domes, an immense archive building, the hemisphere tower, and then the Alamo. I took a lot of photos, and then bought post cards to replenish my stash for future postings. Three living history sites were set up with men dressed as Alamo defenders displaying and discussing cannons and riflery. Directly in front of the courthouse is the Liberty fountain. Nearby are beds of roses both red and yellow. These beds are not near this fountain but the petals from the red roses were placed in the fountain’s layers–an interesting custom as it seemed deliberate but I could not find anyone around to ask. Last weekend was the annual conference hosted by Studio Art Quilt Associates in San Antonio Texas. For those who have not been in San Antonio recently, the city will be celebrating a 300 year history. Not that you would even guess with all the ‘300’s in shrub plantings, street signage, and mentioned at least twice in any conversation with a local resident. This conference moves about the country; I’ve been to ones in Ohio, Philadelphia, and Denver with each one progressively more polished and informative. For me, driving to San Antonio meant a lovely day driving in the Hill country outskirts and stopping for the requisite spring time photo of bluebonnets. I didn’t find the large masses but at a truck stop in Luling I managed to get a nice photo or two. And of course, there are more wildflowers than just the bluebonnets. San Antonio is not my favorite city to drive around in but I timed my arrival to early afternoon on a week day. Traffic was minimal but parking spaces were at a premium. The hotel offered valet parking only and the attendant claimed he was expert in standards but I only allow a very small number of people the privilege of driving my truck. It is easy to hear me coming with that diesel reverberating in all that concrete but I managed to find a nice spot, hauled my belongings to the hotel lobby and checked in. I admired the lobby–a bank in earlier years—with art deco motifs on the elevator doors, the cornices, and a fabulous stained glass window featuring the Alamo. 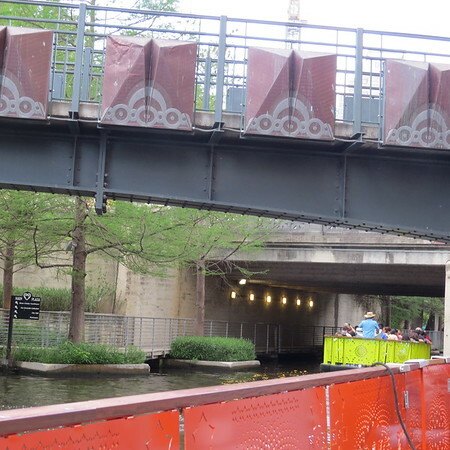 A RiverWalk cruise was the adventure of the evening–I took a few photos but then decided I would just enjoy the view. What is it about nice large orange five gallon buckets that is so inspirational? I have more than a few of them–but I use three of them to accomplish dyeing. Holus Bolus decided to make Swing Coats from some Bamboo fleece fabric. Bamboo is incredibly soft—and incredibly heavy when wet. We employed my mixed dye with play sand technique. The dye particles tend to cling to the sand until it is released by the washing soda on the fabric. I have several drop sheets that have seen many episodes of dye/screen printing/shibori/painting–in general art messiness. We decided to make the coats first so we could tell where the dye would go–including the hats and then dipped into washing soda, spread them out on the dropcloths and sprinkled dye. They had to set for about two hours or so–then they were rinsed, the sand shaken off, and into the washing machine. The results were quite colorful–I don’t have photos of the end product but we will be wearing them at Houston Quilt festival this November. and just so you know–I did spend quite a bit of time sewing while there—sewed up all these double 9 patches while I was there and that swing coat and then maybe one or two other projects as well. This was my work station. The show has always been fabulous but this year’s showing seemed more subdued. Perhaps it was post Harvey recovery or maybe it was the glow of the Astro’s championship. Each year I pick a quilt that is my favorite in the show–and this year there wasn’t one. This was part of a quiltmania block of the month with each block including a cat or a dog. Sepia monochromatic pieces were in abundance in all categories but thankfully not with the token bit of red. One piece had a lovely unusual background of strips featuring a white daisy. Canadians outdid themselves in representing their country–the rolling 9 patch seems to be a favorite. But the best quilts were those of Haiti. They were intricate story pictures of axioms, current events (earthquake), and every day life. I did not manage to get information about the creators of these pieces and so am posting just a small fragment of their work. Please do not use them but enjoy them. Somehow I managed to be at the Rare Bear booth when Rob Appell and Jenny Doan came by to work on the bears and then Alex Anderson appeared—she and Jenny had never met. Both Jenny and Rob needed help in threading their hand sewing needles to finish up the bears. Twice a year a group of friends gather together for a few days of fun–eating, laughing, and some sewing. The location varies and all of them have been great, most requiring more travel for one of us–but this August we met in a lovely retreat in Athens Texas. The house was modern in style looking a bit odd in the middle of woods and A-frames and log cabins along the road. Surrounding us was a field all with utilities laid in for a housing development that never happened. Trees and deer and hummingbirds were abundant. I took dozens of pictures of these little gems but since we had filled up the vehicle with necessary supplies–my tripod had to stay home. I find serenity in open spaces, solitude, and nature…all a welcome contrast to my usual hectic busy life—and then of course, the wonderful food prepared by others and cleaned up by others–I was a failure at that–putting up dirty dishes thinking the dishwasher was just not working very well and then managed to spill coffee all over the counter-top. You might think all of that was intentional to get out of kitchen duties–but truly–cross my heart–I am capable–but just not that week. My friend and I had looked forward to this weekend with great anticipation. Two days in class with Bonnie Hunter at Stitchin Heaven. She had been to a workshop with her in our local guild and I went to one in Las Vegas Nevada–where regretfully I missed that day due to food poisoning. We were pleased to see we could set our machines up the afternoon before. When we arrived the next day, we discovered more tables and chairs had been added, crowding nearly 50 people into a space that comfortably fit about 25—space is needed to assemble fabrics, cutting tools, laying out of pieces and parts and so forth. Although the owner apologized for the space—we discovered that there were several people on the waiting list now in class with us. Perhaps an alternate venue had been planned and canceled at the last minute.This was touted as ‘make a new friend’. The two people sitting in front of us never stopped talking during the entire two days and were definitely not people I wanted as friends–I have a MP3 player with my choices of music. 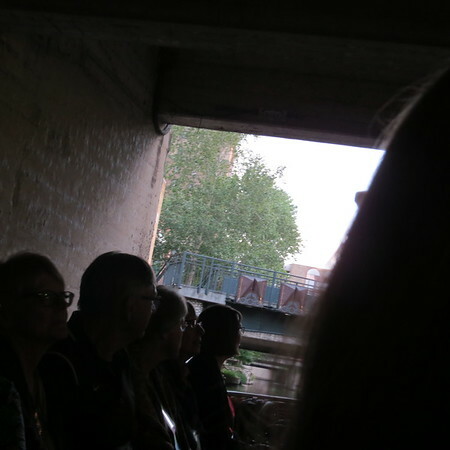 There were four more rows in front of them–we were all a captive audience. Our teacher was exhausted and spent most of the two days sitting with her friends and chatting with them. Unlike other venues, she did not eat lunch with us, choosing instead to leave with her friends, perhaps a wise choice as the food was reminiscent of school cafeterias. It was a disappointing two days of class. However, we did go shopping in a wonderful group of antique stores. Lots of fun things to see. I bought an antique top for $35 to quilt; we went to see Godspell produced by the community theater group–not exactly talent rich but still enjoyable. The Best Western was shabby but clean and the manager-owner was an early bird and so she had coffee and breakfast ready at 5:30 instead of the 6 or 7 as advertised. She also was amenable to some of our group setting up their machines in the lobby and sewing in the evenings. She enjoyed people and chatted with us as though we were family. Next year they have promised a full week of class and in a larger classroom. I’m not sure I want to repeat this experience. I did however, complete the first day’s project at home–I didn’t get much done there working from fabrics in my lap. The second day’s project is minimally started; perhaps I’ll throw those pieces into an orphan block and pieces box. A whirlwind of three days with much laughter and some sewing–and more cutting and sorting on my part has passed. Holus Bolus met for our spring retreat and as usual the time passed all too quickly. I have been home now for three days and still cannot find my pins or my scissors. I remember putting them in my baskets/bags/boxes to return home but can I find them? I did find my knitting with a few dropped stitches–no problem there–the yarn is multicolored and those dropped stitches will fit right in with all the others. We did manage to fit a lot of things in–a trip to the Piney Wood Quilt Guild show, a shopping trip to Atkinson Candy Factory Outlet, AND to the fabric lady who is available by appointment only, a passing off of our row quilts we had all worked so diligently on–lots of squeals of delight here—and then on to serious business. We traded fabrics to do a piece representing ourselves using Chagall as our inspiration. I made spring rolls, the sisters cooked lovely meals, and Larry made steamers of shrimp, corn on the cob, and potatoes on the grill. Fritzi was excited to see us–and probably cried when we left–we all had to pet him.